The Digital Transformation of Asia Pacific’s massive manufacturing sector promises to deliver USD 387 billion leap in regional GDP within three years. This finding, in a Microsoft commissioned survey and authored by analysts at IDC, throws a spotlight on the importance of rethinking traditional business models in this technology-driven age. The survey, of 615 manufacturing firms in 15 economies across Asia Pacific, identifies managing costs as the biggest business concern among CEOs in the region. And, it is through that lens that they view digitalization largely as a way reducing expenditures. In its analysis, IDC agreed that while rising costs represent a real worry, it is a backward way of looking at the power of digital transformation. The good news, however, is that the CEOs rightly grasp the imperative of developing new business models to beat the rise of disruptive competitors. It is here that true Digital Transformation holds its greatest potential for success. “In other words, manufacturers are trying hard to balance priorities. They want to keep traditional revenue streams ticking along while keeping a fixed eye on the fast-approaching future. We believe that change is not coming as quickly as it should. Manufacturing companies have to accelerate on truly transformative measures otherwise they run the risk of being lagged behind”, said Victor Lim, Vice President IDC Asia/Pacific. Digital Transformation initiatives bring tangible results to manufacturing companies. 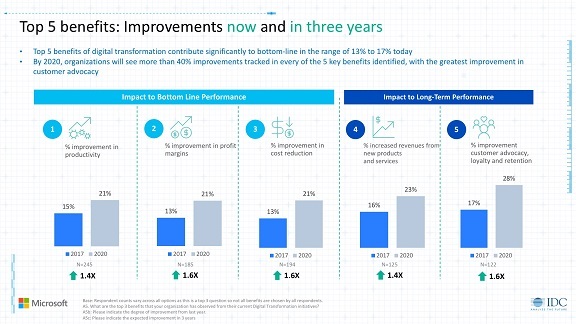 The survey identifies five top benefits, three of which relate to the present bottomline—improvement in productivity, profit margin and cost reduction. And two others—revenue from new products and services along with improved customer loyalty— represent long-term sustainable growth and are truly transformative initiatives. They demonstrated the highest impact of all five last year, from 16% to 17% (see chart below). Moreover, revenue from new products and services along with customer loyalty show the most promise for improvements in the lead up to 2020, at 23% and 28% respectively. Simply put it, Digital Transformation is about reimagining how organizations bring together people, data, and processes to create value for their customers and maintain a competitive advantage. So how does an organization start? The answer is gathering data—lots of data. A great example of a manufacturing firm gathering data on old processes and using that data to develop new business opportunities is Toyota Industries, which moved from being simply a maker of forklifts to a company that also sells complete digital warehouse management solutions around the world. 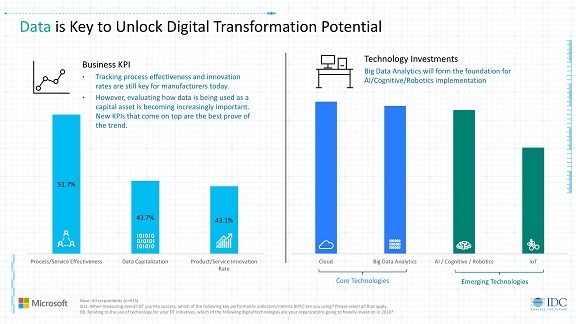 “Leveraging data is a smart and creative way has opened a whole new opportunity that places Toyota Industries in a strong growth trajectory,” said Scott Hunter, the Head of manufacturing at Microsoft Asia Pacific. The Survey finds that most manufacturing companies in the region understand the potential power of the data they are collecting. They see data as an asset akin in value to cash holdings plant equipment or real estate. Moreover, they are also adopting Key Performance Indicators (KPIs) based on data. But again, they tend to prioritize short-term process and services effectiveness over long-term data capitalization along with product and services innovations. Just like the benefits described earlier, it is a matter of finding the right balance between the present and the future. Microsoft’s Hunter said Digital Transformation in Asia means moving the focus from process automation, optimization, and productivity improvement efforts into developing new business models to stay competitive. Another proof point that manufacturers are serious about data is highlighted by where they are choosing to invest this year. The evidence is clear— Asia Pacific manufacturers are putting a lot of their money into the core technologies of big data analytics and cloud computing. They are also investing in the emerging technologies of Artificial Intelligence (AI) and Robotics, along with Internet of Things (IoT). “The pay-off from harnessing data is improved products and services, from that they get a value that will lead to new business models,” Lim said. Let’s talk about the traits of leaders in digital transformation, and how manufacturing sector differs from the overall picture that we see in the Asia Pacific. The survey shows that 'leaders' in the manufacturing sector are ahead of the rest of leaders in Asia Pacific* in terms of each having a key person or dedicated business unit to drive Digital Transformation. However, they lag in the allocation of budgets as a permanent part of their profit and loss statements. They also remain 'siloed' within their organizations and are slow to push all the departments on to the same path of change. When individual plans and initiatives become aligned with an overall change strategy and scaled organization-wide, the effect of collaboration helps achieve the broader Digital Transformation results. Still, there is no shortage of challenges. The most pressing is the need to recruit talent with skill sets that can drive change, the Study finds. Shaping the workforce of the future is also a major issue because 85% of jobs in manufacturing are expected to be transformed in the next three years. And almost 60% will be redeployed to a new position and/or retrained for digital work. Microsoft and IDC have a roadmap on how to digitally transform. It starts with developing a digital culture. It encourages the use of data across all the processes in an organization and sharing it externally with customers and partners. This could mean a manufacturer, looking outside its own organization and building a digital supply chain and data-sharing across an entire ecosystem. Embracing a “micro-revolutions” approach is important as a series of small steps leads to the bigger strategy realization. New ideas should be quickly tested, allowing for room to fail fast and learn fast. Data is key to unlocking the potential of Digital Transformation, which can change a product-centric company to a services company that delivers on evolving customer needs. Embracing new technologies, such as Big Data Analytics AI, IoT must be at the heart of any Digital Transformation effort.